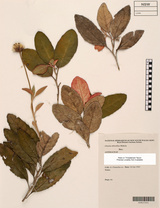 Description: Shrub to 0.6 m high. Leaves alternate, scattered; lamina elliptic or ovate, 25–134 mm long, 16–35 mm wide; apex acute or obtuse or rounded, without a mucro; margins toothed or entire, flat; discolorous, upper surface glabrous and green or grey-tomentose, lower surface beige- or rusty-felted; venation reticulate; petiole to 25 mm long. Heads terminal, solitary, pedunculate, 40–48 mm diam. ; peduncle to 330 mm long. Ray florets 8–12, pale blue or white tinged mauve. Disc florets c. 35, yellow. Achenes silky; pappus with 77–100 bristles in 2 series. Distribution and occurrence: Grows in dry sclerophyll forest on sandy soil; from Coaldale (north of Grafton) to Woolgoolga, rare.